"You bring death," the voice said, "and Hell follows with you." 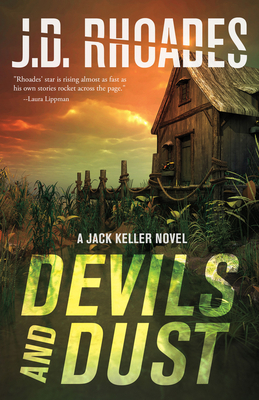 Relentless bounty hunter Jack Keller returns in Devils and Dust, the long-awaited fourth installment of the critically acclaimed series from award-nominated author J. D. Rhoades. Keller's been in exile, living a quiet life in the desert, since his disappearance after the cataclysmic events of 2008's award-winning Safe and Sound. Now his old friend and former employer Angela has tracked him down and needs his help. Oscar Sanchez, Angela's husband and Keller's best friend, has disappeared while investigating what happened to the sons he was trying to bring to America. If anyone can find Oscar, Keller can, but along the way he has to confront his own demons and his unresolved feelings for Angela -- now his best friend's wife. Keller's quest takes him from a corrupt Mexican border town to a prison camp in the swamps of South Carolina and pits him against human traffickers, violent drug lords, and a vicious group of white supremacists perpetuating an evil as old as civilization itself in the name of God. All of them are about to learn a hard lesson: if Jack Keller's after you, he's bringing Hell with him. Born and raised in North Carolina, J. D. Rhoades has worked as a radio news reporter, club DJ, television cameraman, ad salesman, waiter, attorney, and newspaper columnist. His weekly column in North Carolina's The Pilot was twice named best column of the year in its division. The author of The Devil's Right Hand, Good Day in Hell, Safe and Sound, Breaking Cover, and Broken Shield, he lives, writes, and practices law in Carthage, NC. Follow him on Twitter at @jd_rhoades.